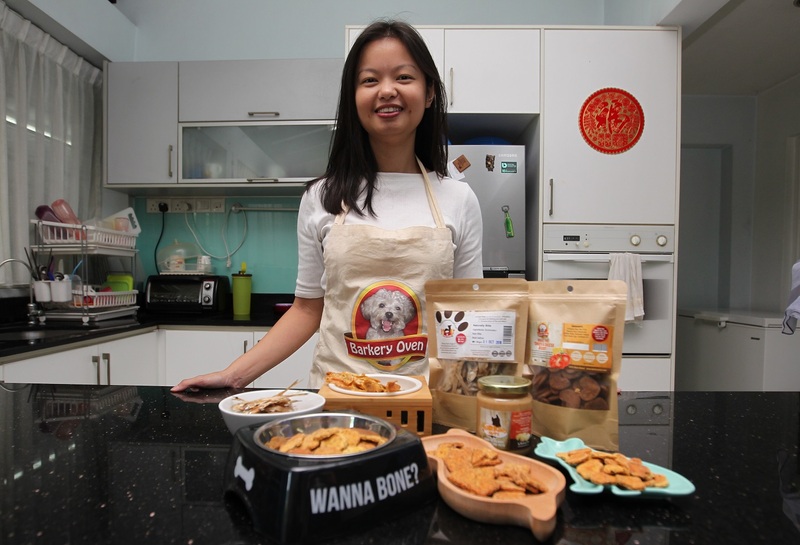 Chan Chui Shia of Barkery Oven uses fresh, wholesome ingredients to prepare pet food that can even tempt the owners. Chan Chui Shia quips that ­Barkery Oven is a one-leg kick operation, a direct translation of yat kiok tek in ­Cantonese, which means she has to multitask. On the plus side, baking treats for four-legged pals lathers the labour with fun. 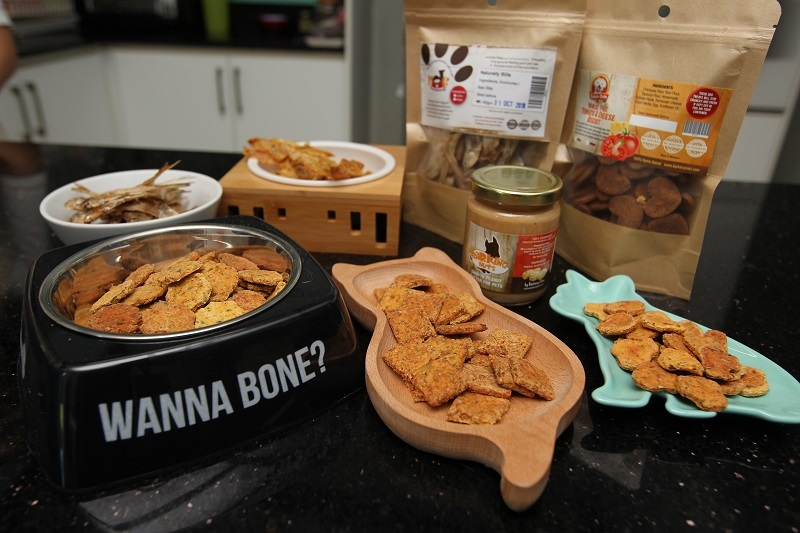 Chan works in an extended wing in her mother’s kitchen in Sri Hartamas, Kuala Lumpur, painstaking­ly producing gluten- and grain-free biscuits, natural dehydrated food and special treats high in protein, fibre and omega, targeted at pets with sensitive skin. Around her are containers filled with ­dehydrated mackerel skin, ikan bilis and chicken and pork slices marinated in herbs and spices, salmon, ­mussels, sweet potato, pumpkin and carrot, as well as dog biscuits filled with oats, nuts, cranberry, cheese, fish, tomato and vegetable. There are pawffins and fudges baked with ­banana, carob, cheese, chicken liver and peanut butter. For those looking to give their pets something special, she has jars of mango kaya, oat and cinnamon pancake mix and peanut butter. And for Woofer’s birthday, how about a bone-shaped dog-friendly cake topped with icing? She conceived the idea of producing wholesome treats for her own furkids a decade ago, after online research unearthed news on pet food recalls in the US. Lack of regulation on their production leads to poor pet nutrition, which in turn can cause skin problems, allergies and organ failure. Chan learnt about ingredients and labels from trawling websites on home-cooked pet food and home-made treats. “The mass-produced pet food industry uses things that people reject or don’t want to go to waste. Leftovers and by-products that humans would never consume go into kibbles and treats.” Commercial treats also have lots of sugar, she adds. “All our products are freshly made, using ingredients that we get from the market or direct from the fishermen in Kuala Selangor. Chan taste-tests everything herself and will reach for a dog biscuit when she feels like snacking, under­scoring her point that what’s good for Woofer is good for her too. She says there are parents who buy her oats and cheddar biscuits for their one-year-and-above toddlers. Her recipe seems to be working well. Barkery Oven, set up in 2011, is geared for expansion. Last year, Petsmore and Pet Lovers Centre approached Chan to supply her products to their shops. “They see the need because pet owners are starting to ask for more nutritious treats. Total sales in 35 pet food outlets across Malaysia make up about 60% of her business. The remainder comes from online customers and regulars who go to her to pick up what they want. Stepping beyond the country, Chan has a Hong Kong partner that takes some of her products and packs them for sale online. Barkery Oven Hong Kong went live at end-May. Constant requests from cat owners has led her to create Purrdy Treats, biscuits and dehydrated fish and chicken for those fussy felines. The new brand will be released in the third quarter of the year. Chan, who is working on the label, packaging and logo, says there is a huge market for it, as statistics show that 50% of pet owners in Malaysia have cats while 30% keep dogs. She tests her treats on Suki, the stray that showed up at her doorstep three years ago and chose to stay. She is also in discussions to open a pet deli where people can walk in and grab a freshly baked item for their dogs. She hopes to grow the distribution side of ­Barkery Oven and her online operations, which means finding the right partner to “fill in the gaps where I am weak, like business development”. Building a brand and letting people come to her works, but the numbers are small. Chan also counts herself lucky to have her ­husband helping with Barkery Oven’s website and digital ­aspects and four sisters who give her emotional support and advice on retail, operations, costing, SOP and tax. This gives her more time to concentrate on what she enjoys most — developing healthy, delicious treats for furry friends. This article first appeared on June 4, 2018 in The Edge Malaysia.